You have key pieces of equipment in the field, but you’re running low on fuel and there’s no time to waste transporting heavy machinery back and forth to refuel. That’s where SCL’s mobile fueling solutions can benefit your operation – providing you with the convenience of on-site fueling that allows for logistical control, huge time savings, and the ability to monitor your operating expenses with ease. Mobile fueling is a convenient and cost effective means of managing your remote fuel needs, keeping your equipment operational with increased uptime while minimizing costly downtime. As part of our mobile fueling solutions at SCL, we bring the fuel directly to your jobsite, terminal or fleet location and these fuel deliveries can be conveniently scheduled around the clock, 365 days a year. Whether you require fuel for a fleet of vehicles, trucks, heavy equipment, on-site tanks, tank trailers or generators, mobile fueling gives you the flexibility to focus on the job at hand while knowing that your fuel needs are covered. Our fleet of trucks can accommodate a full range of on-site bulk fueling needs with either bobtail or wet-hose delivery services, and being fully equipped with fast-flow nozzles that pump at a rate of 50-60 gallons per minute, you will save money by minimizing expensive equipment downtime. Deliveries are made using a fully automated system that allows for greater reliability while minimizing human error and the risk of fraud. With our mobile fueling solutions, your fuel is delivered by one of our qualified drivers, trained to operate in the safest and most environmentally responsible way. Save Time – Focus on getting the job done without having to remove key equipment for refueling. Save Money – Minimize costly downtime and stay ahead of your fuel needs with intuitive inventory tracking and scheduled deliveries. Flexibility – Order fuel as needed or enjoy the convenience of regularly scheduled deliveries to accommodate your needs. Accessibility – Depending on the fueling needs of your fleet, we are happy to accommodate short-term, mobile projects or long-term, permanent operations. Safety – Our HAZMAT certified drivers are highly skilled in safely delivering your fuel, regardless of whether it’s easy access or difficult circumstances. Reliability – Relax knowing that your fuel is being delivered on time, and when you need it. Integrity – Special care is taken to prevent the cross contamination of products and costly overfilling while accurately delivering the specific products you need. 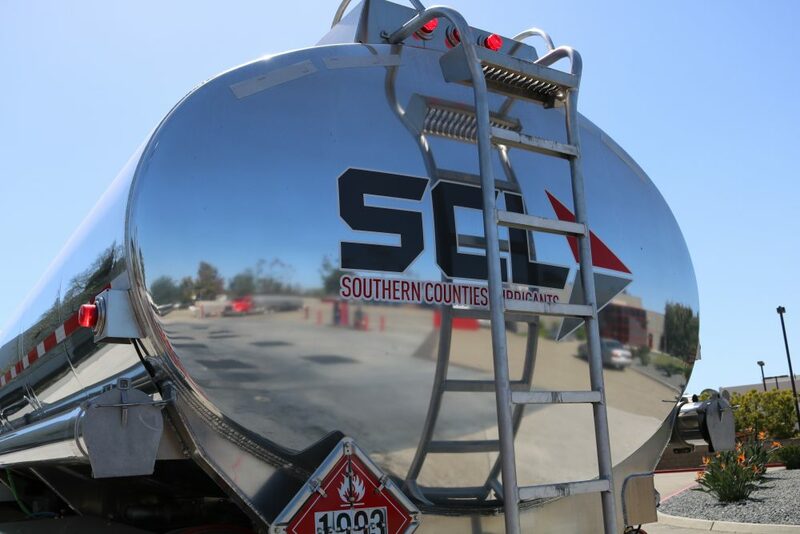 We understand that time is money, so at SCL, we pride ourselves on delivering convenient fueling solutions to a wide range of industry sectors and fleets such as construction sites, landscaping operations, municipalities, special events, waste management, freight and emergency services. If you need fuel delivered to your fleet safely and reliably, our mobile fueling solutions will assist your business in increasing productivity and efficiency, saving you both time and money. We delivery to San Diego, across Los Angeles, Orange and Riverside Counties, and the Bay Area including San Francisco and Oakland. In a wide range of industrial sectors, if there’s metal touching metal, oil is involved. At SCL, we’re here to protect and optimize the machines that keep our country moving and we pride ourselves on providing superior logistics and solutions, extensive product and industry knowledge and total performance satisfaction for our customers. For information on how we can assist your fleet in choosing the optimal products at a competitive price, contact an SCL consultant today.